To subscribe to your Táve calendar feeds on your Android phone or tablet, you’ll be required to subscribe within your Google account using the instructions below. After following the step-by-step guide below, you will need to refer to the calendar app you use on your Android device to tell it to show that new calendar feed on your device calendar. Each Android device varies, so refer to your phone’s manual if you get stumped. Once you’ve saved the new calendar feed, you’ll see a URL created (as seen in the top screenshot above). These URLs are what we will need later to setup the feed subscription in Google Calendar. Once you open your Google Calendar window, you can subscribe to a calendar by going to Other Calendars along the left side of the screen. When you select the little upside-down carrot you’ll find an Add by URL option in the menu that appears. 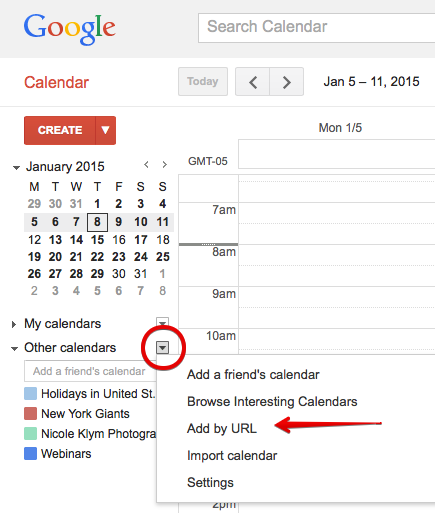 Now, head over to your Táve calendar feed settings and copy the URL of the feed you’d like to subscribe to. You’re going to paste it into the window that pops up in Google Calendar and subscribe. You’ll see the new calendar appear in the list of Other Calendars on the left. If you select the menu to the right of your new calendar feed, you’ll see some customization options. 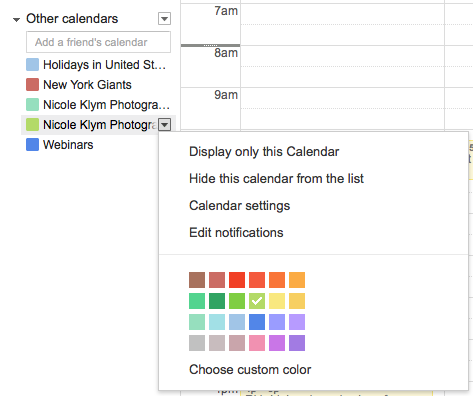 For example, you can choose the custom color for this calendar right here in this menu. You can edit the name of the calendar by clicking on Calendar settings or add some default notifications for your Táve calendar events in Edit notifications. After following the step-by-step guide above, you will then need to refer to the calendar app you use on your Android device to tell it to show that new calendar feed on your device calendar. Each Android device varies, so refer to your phone’s manual if you get stumped.